The Bovinians And Who They Are. Dorothy's Magical Shoe - mixed media. Enclosure constructed with vintage Italian frames ornate lantern, candelabra and lamp stand. All custom assembled and hand finished by the artist in a high metallic silver finish to house the hand adorned shoe, finished in Friesian hide and hoof. Lamp sits on an iron stand topped with tempered beveled glass. Born July 4th, 1898, Dorothy was the product of Irish immigrant parents. Her father was a cobbler, mother a milkmaid and she was the youngest of 9 girls. After receiving a copy of L. Frank Brahman's book, "The Wizard of Oxland" she fell in love with the idea of having a magical pair of shoes to transport her away to the Highland's emerald pastures. She begged and pleaded for her father to craft her a pair, and upon her 5th birthday he granted her wishes. Created from Friesian leather, fashioned with magical silver cow bells, ruby red bows and buttons, they were the talk of school. All her classmates marveled and listened as Dot crafted exaggerated stories of her magical outings to the highlands. 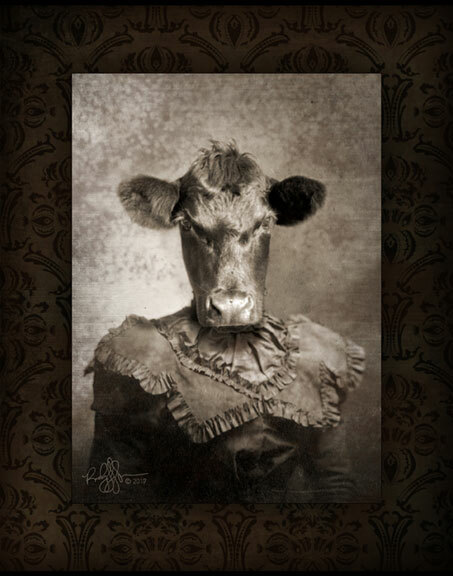 Ms. Dorothy Shoemaker, digital fine art composite. 8" x 10" matted in vintage champagne moire taffeta, finished with an ivory and gold vintage frame. Judy is Dorothy’s cousin and best friend. During a horrible drought Judy comes in contact with Clostridium chauvoei and developes Blackleg and dies. She is brought back by the wishes of Dorothy her magic shoes and the mysterious Madam Raven McPhee. In gratitude for her life Judy gifts Raven the one thing that she holds most dear to her heart. Her grandmother's doll, Cookie. Raven was the area healer and midwife in Oxland. She was called upon whenever there was illness or mental anguish, even though it was rumored that she was also a necromancer. She was never married nor had any children and as legend goes, she would ritualistically conjure the spirits of dead and stillborn children to fill her void. In order to do this she would need to have a belonging of the child, usually a shoe, and was often seen in the cemetery lingering near the graves of freshly interred children. With shoe in hand she would return to her cottage and gather the things needed to conjure the spirit. An old baby buggy and doll were used to create an aperture in the quantum in which the spirit could pass. Skins of the golden cicada, black peppercorns, scarab beetles, ink of charcoal and angelica root oil were used to create the potion needed, for both protection of the spirit and necromancer herself, and a living creature (most often a toad) for sacrifice as well as sacrificial candle. 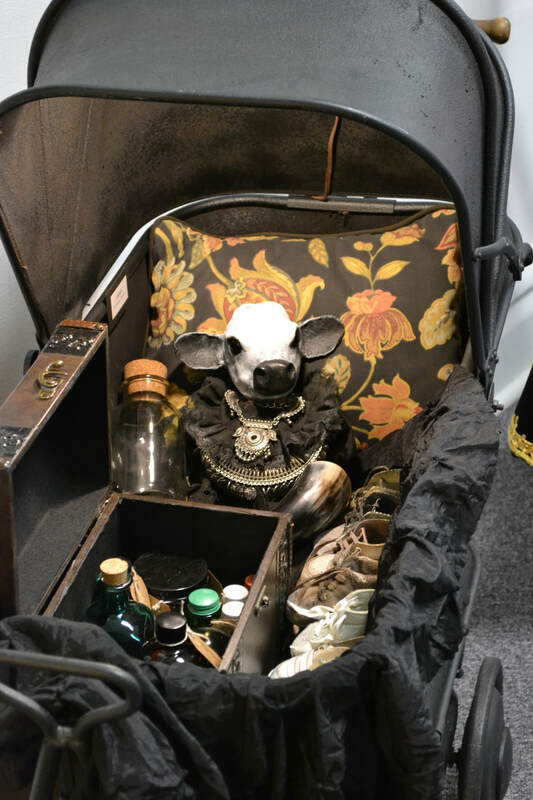 After placing the doll in the buggy along with the deceased's child's shoe, she would make the potion by crushing the cicada skins, peppercorns, and a scarab beetle together in the mortar and then mix it with ink of charcoal and angelica root oil. Ink of charcoal was needed to prevent the conjured spirit from entering Raven's body and the angelica root oil is said to have protected the child's spirit from evil as it passed from one realm to the other. She would pour a bit of the potion into the dead child's shoe and consume the rest using a drinking horn hallowed by the Wizard himself. As the sacrifice was made to Arawn, ruler of Annwan, kingdom of the underworld, his hellhounds could be heard barking and growling as the spirit re-entered this world. Upon doing so it would absorb the life and essence of the sacrificial toad to the point that it's mass was sucked dry and mummified. As long as Raven kept both the child's article and the scarified toad, the spirit would be tied to her for all eternity. When she’s summonsed she materializes from a twisted murder of crows. The armature for the doll started as an antique early 1900's composition doll. This was the most popular form of doll making in that era. The production of composition dolls ended in the 1940's. In keeping with the material, I sculpted the head from paper clay and used black glass vase marbles for her eyes. The dress is ink dyed linen trimmed with tin decorations. She is truly one of a kind. Illustration showing cookie resting atop a limestone bridge that crosses Prairie Dog Creek ​at Rockwell Cemetery. Cookie resting in Ravens Pram. Raven McPhee used the doll as a conduit to conjure the spirits of dead children. She was often seen in the cemetery pushing her pram near the graves of freshly interred children. Pictured is the display at OZtoberFest 2017. Cookie rests in a vintage 1920's pram finished in black textured rubber and lit from the inside. Also resting in the pram are the rest of the items that Raven used to bring forth spirits.